The following is the second post in our series on augmented reality in the AEC industry. Check out Part 1 here. While the release date of Microsoft’s holographic headset HoloLens is hotly anticipated, we were excited to get a first-hand rundown of Trimble’s new applications for the head-mounted computer earlier this month. During a videoconference Trimble’s Mixed Reality Program Director, Aviad Almagor, was kind enough to walk us through the ins and outs of Trimble’s collaboration with Microsoft on the HoloLens project. While Trimble is known for its GPS receivers, laser rangefinders and unmanned aerial vehicles, it has gradually ramped up its Building Information Modeling (BIM) portfolio since buying the 3D modeling software package SketchUp from Google in 2012. Now Trimble’s newest generation of tools for the AEC industry, including SketchUp, Trimble® Connect and Trimble V10 Imaging Rover are being developed in lockstep with HoloLens. “So you can move from completely virtual — completely immersed in the view of a design the way that people will experience it — or you can experience the completely real and just have some tags on top of it or anything in-between,” Almagor, an architect by trade who has an extensive history in computer software and programing, told us. The marriage between these products and HoloLens is changing the way our industry interacts with data; simply gesturing, gazing or speaking can summon digital dropdown windows with information pertaining to a specific point of view. 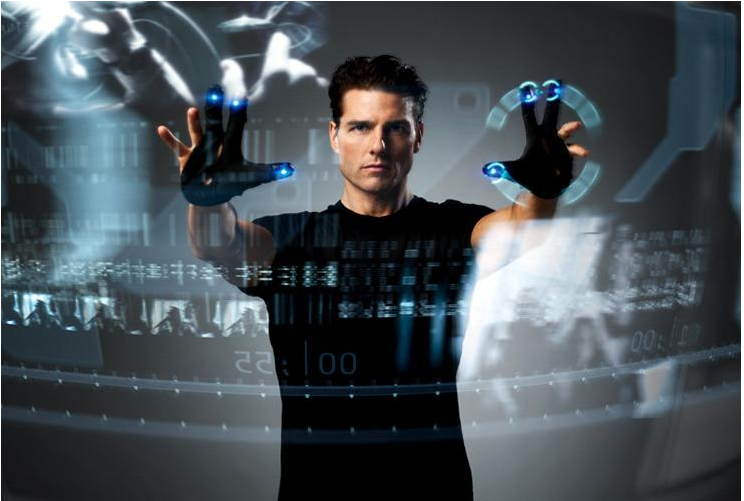 Your cursor automatically moves to the direction you look and commands are activated by your gestures and voice — putting us one step closer to the kinds of technologies portrayed in the sci-fi flick Minority Report. The software uses object/surface recognition (via multiple sensors embedded in the unit) to understand its location with high levels of accuracy, and will then log that data as a saved location. 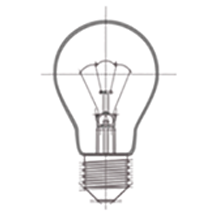 This means users can turn their head or leave the room and when they swivel their head again or return to the room the digital object will be in the same place regardless of the viewing angle. The possibilities of such technologies for teams collaborating on models and renderings are vast. Imagine multiple people standing on opposite sides of a digital model and or rendering simultaneously viewing it from multiple perspectives in real time. If the model is changed or rotated all parties would immediately see those changes from their individual vantage points. If someone is attending the meeting remotely, an avatar would be presented to show the direction they are looking and what they are viewing. These capabilities could allow design teams and contractors to view complications in the field in real-time, including the ability to manipulate and change items on the fly with a high-level of accuracy. Finally, HoloLens could be a crucial facilities management tool that is handed over to owners along with the keys to their new building. Donning the headset could easily help with everyday repairs as well as identify immediate solutions to problems such as a pipe burst inside a wall. 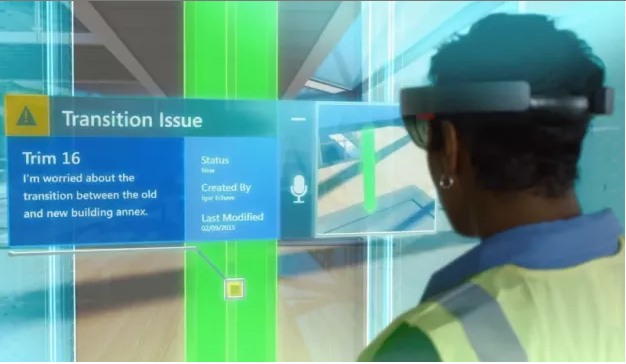 In addition to allowing an owner to “see behind walls” as they walk the halls, he or she could also see the maintenance history of the building, identify replacement parts and speak to a live technical support agent all while wearing HoloLens. Although we pressed him, Almagor could not share any information about the exact date HoloLens will be available to the public. He did say, however, that according to Microsoft’s announcement, the device will be available within the Windows 10 time frame. He also said Trimble is already in discussions on how they will bring their collaborative solutions to market. 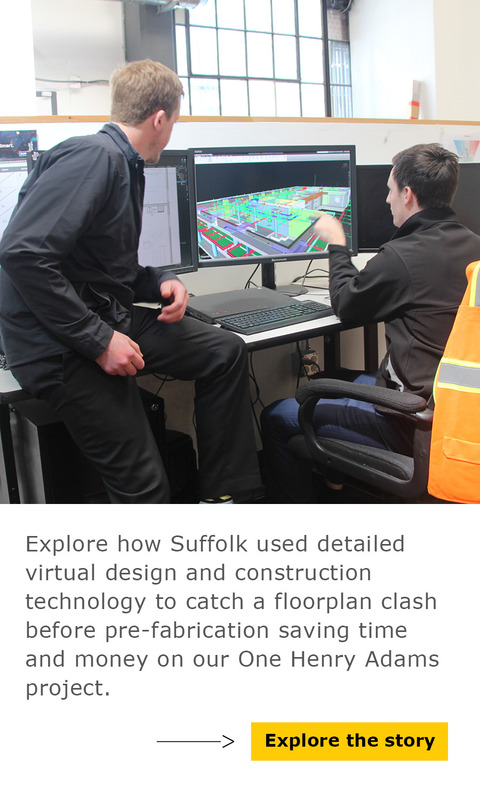 This post was a collaboration between Suffolk Construction’s Project Engineer Christopher Murphy, who is also on our internal R&D group, and Content Writer Justin Rice. If you have questions, Christopher can be reached at cmurphy@suffolk.com and Justin can be reached at jrice@suffolk.com or follow him on Twitter at @JustinAlanRice. Thanks a lot for a great overview of collaboration transforming construction technology, your post helped me a lot.